The wait is finally over. Nikon has unveiled its new mirrorless system, the first with a 35mm format sensor. It arrives seven years after the not-so-successful Nikon 1 series which has now been discontinued. We had the chance to see a pre-production version of the two cameras at the UK press event and these are our early findings. You can watch the video or read the written version below. The Z6 and Z7 look identical, and I mean truly identical. Except for the name engraved on the front, the cameras share the same dimensions, weight, magnesium alloy construction and weather sealed chassis. 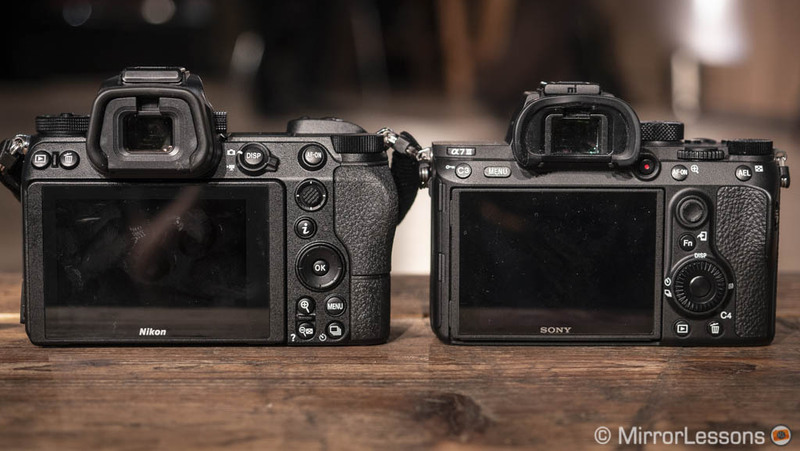 Like the Sony A7 series, what makes the difference is what’s found inside. But first let’s talk about the design, which I have to say gave me a positive impression. The cameras are reasonably small and compact. In fact they’re only slightly larger than the A7 mark III. 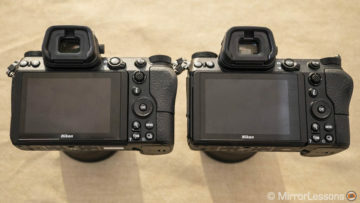 However the larger and taller front grip definitely adds more comfort when holding the camera, or using large lenses. I like the button layout: everything feels precise and has a very nice tactile feel. I particularly appreciated the still/video mode selector on the rear and the two front function buttons. The AF joystick is precise and very quick to use and there’s lots of room for customisation including personal menu pages and a quick menu. Each Z lens comes with a function ring, and you can decide to use it for the aperture, manual focus or exposure compensation. It’s a very clever feature. The rear LCD is touch sensitive and I was pleasantly surprised by its precision and reactivity. Not only does it let you change the focus point, but you can also navigate the menu and change settings. The screen is large and has an excellent resolution. 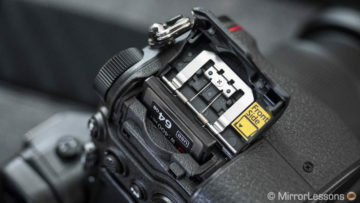 There is also a small screen on top to check your settings just like the ones you can find on high-end DSLRs and some professional mirrorless cameras. I really like the EVF: it’s very sharp with more than 3 million dots of resolution and a large magnification of 0.8x. Even when wearing glasses I was able to compose very easily with both cameras. There is a microphone input and headphone output, a USB C port, as well as a micro HDMI port. Sadly, there is only one memory card slot. 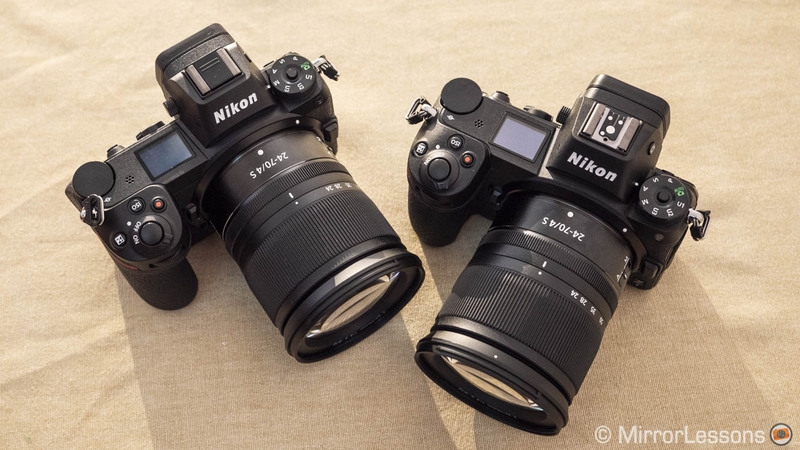 Nikon has chosen to use the XQD type over the popular SD version. The former has a faster speed but is more expensive. And obviously, after many years spent asking mirrorless brands for dual slots on their high-end cameras, I was quite surprised to see that only a single slot made it onto the Z6 and Z7. My guess is that the XQD’s larger size would have required extra space to fit a second card, but given the reliability of SD cards nowadays, perhaps Nikon should have just opted for two SD cards as they did for their D750 for example. 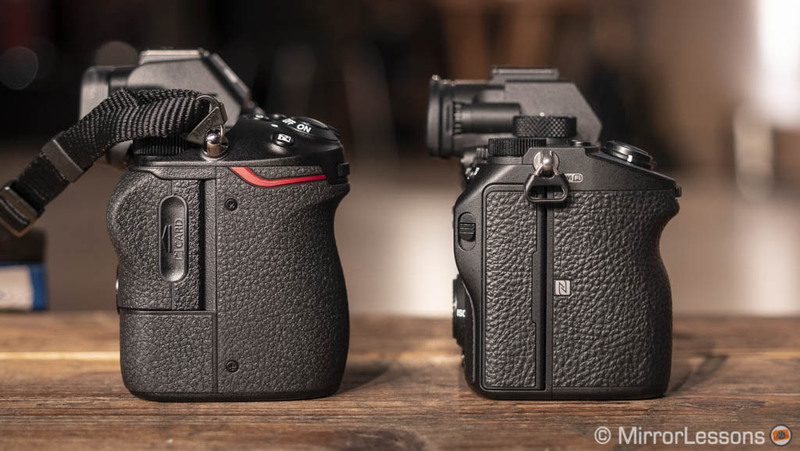 The first difference worth talking about between these two cameras is the sensor. Although they are both based on a back illuminated structure and lack the anti-aliasing filter, the Z6 has 24MP whereas the Z7 has 45MP. The ISO range is also different. Unfortunately the samples I saw at the press event were pre-production so I couldn’t bring home any images. You can shoot in a variety of file formats including 12-bit and 14-bit RAW with different compression options, as well as JPG and Tiff. The second difference is concerns the autofocus points. Both have a hybrid system with on-sensor phase detection. The Z6 has 273 points and the Z7 has 493 points. 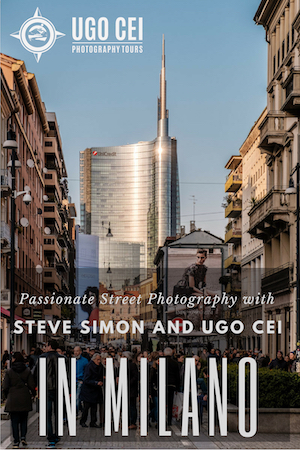 In my brief time at the press event, I found the autofocus to be fast and reactive on both cameras, detecting the moving subject easily and never hesitating. The performance was good when using the FTZ adapter and Nikkor lenses as well. The only part that didn’t convince me is face detection, as the cameras often didn’t detect any faces at all despite there being several people in the frame. But to be fair, I only tested this feature for a few minutes so I’ll reserve judgement for later. The continuous shooting speed is 12fps on the Z6 and 9fps on the Z7, but neither impressed me in terms of buffer depth. Both cameras slowed down significantly after just a few seconds even when shooting in JPG mode. 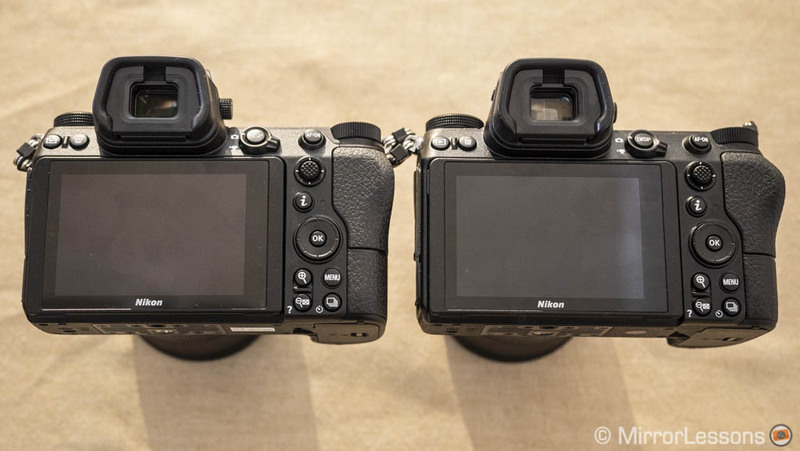 The Z6 and Z7 are the first Nikon cameras to feature 5-axis stabilisation. They can also work in conjunction with VR lenses and manual focus lenses that lack electronic contacts, although in that case just 3 axes are used. On the Z6, taking hand-held shots at 1 second of exposure was easy enough to achieve with a few attempts so the performance looks promising. 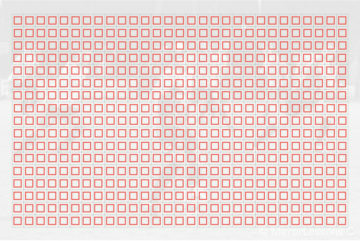 The sensor stabilisation works for video as well and you can also add software stabilisation. Speaking of video, we have 4K recording up to 30fps and a bitrate of 100Mbps. 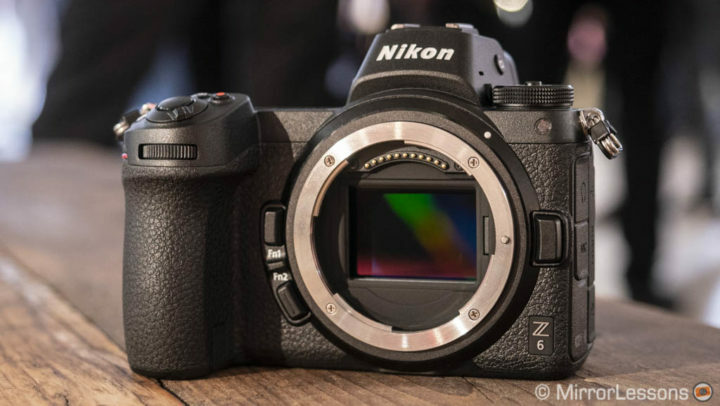 The Z6 does full pixel readout in full frame mode, or FX mode to use Nikon’s terminology. 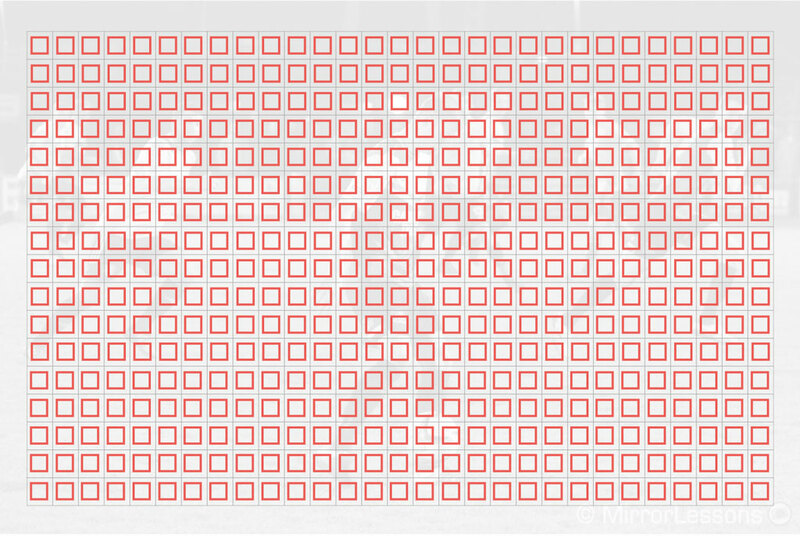 Because of the higher megapixel count, the Z7 does full pixel readout in DX APS-C mode only. In Full HD, you can record up to 120fps with sound, or conform the footage to get slow motion results. 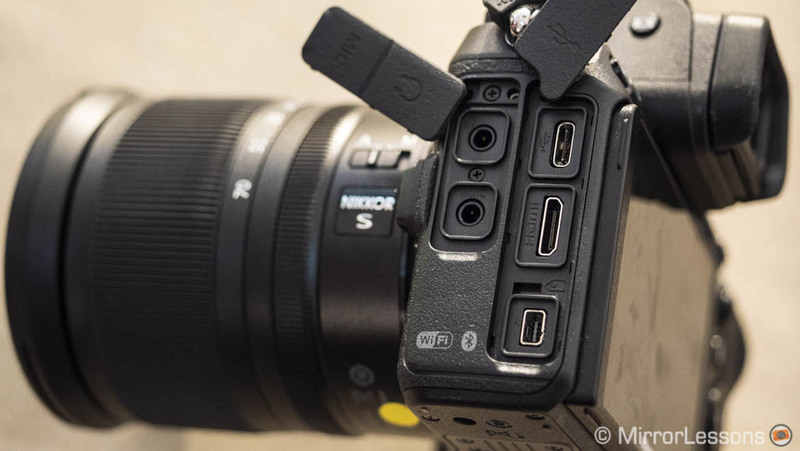 The image profiles you can use for video are the same as those for stills, but there is also the option of a true Log profile, called N-Log, that can be activated with the HDMI port, which by the way also gives you the option of 10-bit output. Of course this means you’ll need an external recorder to take advantage of both features. Other specifications include 4K Video Time-lapse, silent shutter, electronic first curtain, Wifi and Bluetooth. The battery life is rated at around 300 shots for both cameras, which isn’t really exciting considering that the A7 III and A7R III can do double that. Of course real world use will give you more than these figures suggest, but it looks like the Z6 and Z7 will require more than one battery to get through an entire day of shooting. They use a new EN-EL15B battery, but they are also compatible with the older 15a and 15 types. However Nikon warns that the battery life can deteriorate if you use them. The good news is that the cameras can be charged via USB. Finally, we have the lenses. The Z system debuts with a 24-70mm f/4 kit lens and two f/1.8 primes: a 35mm and 50mm. 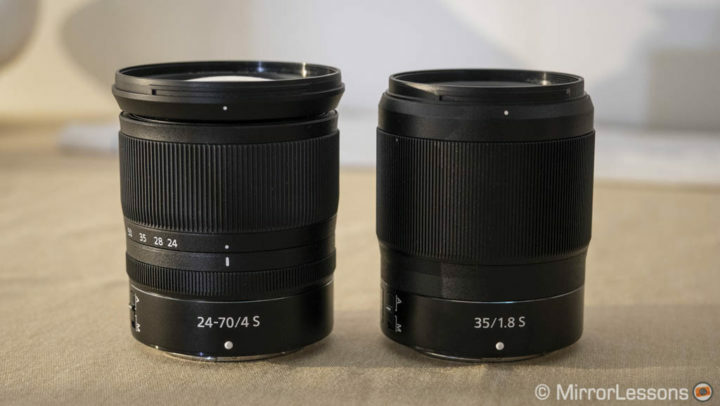 The 24-70 is surprisingly compact, whereas the 1.8 primes have normal dimensions. Nikon insisted that one of the reasons for developing the Z system was to have a large mount with a short flange distance. 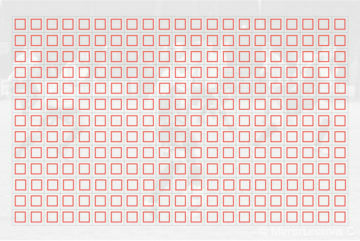 This combination will allow them to design a new generation of lenses with superior optical performance. I’ll be curious to see what kind of quality they will be able to offer. 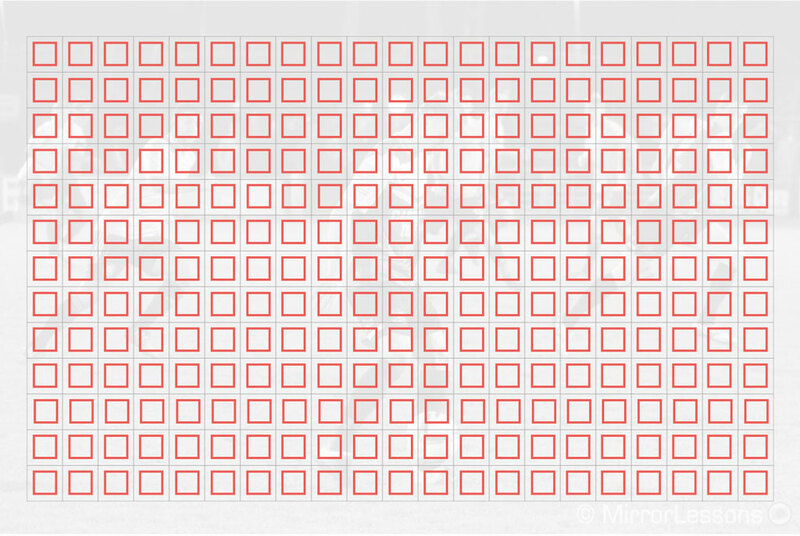 We know that on the roadmap there is a 58mm f/0.95 coming next year, and a 50mm f/1.2 amongst other things. I’ll be honest. 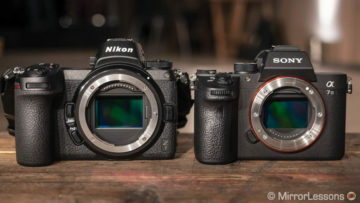 On paper neither the Z6 nor Z7 offer anything new that we haven’t already seen on other mirrorless cameras. There is nothing game-changing, nothing new that pushes mirrorless technology a step forward. In a way, the single memory card slot and the short battery life almost feel like a half-step backwards. That being said, I enjoyed my time with both these cameras. 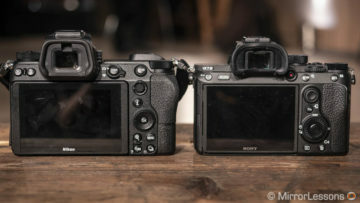 The design and ergonomics feel perfect straight out of the box and very well balanced, and this is where both cameras can have an advantage over the A7 series whose ergonomics are good but not perfect. 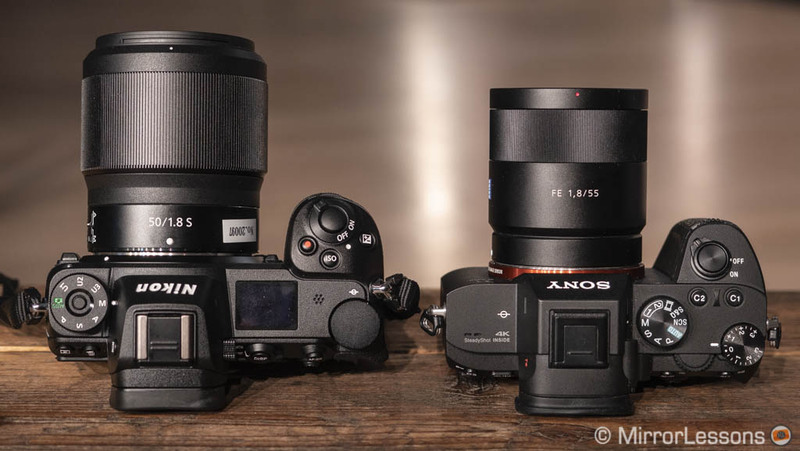 I’m already sure they can deliver excellent image quality when it comes to stills, so my real curiosity is how the autofocus will perform and how good the video quality will be. Only then we’ll know whether the Nikon Z can compete with the Sony A7 series. 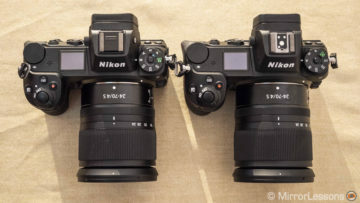 The launch price feels right, at least for the camera bodies and the 24-70mm, but I can’t help but notice that the asking price for the two 1.8 lenses is rather high. I really hope they will stand out in terms of optical performance just like Nikon says.